From the time of quote to shipment of your product, you will experience unparalleled service from AccuRounds. Doing business with us will be seamless. You will receive your job on-time, to exact specifications. The AccuRounds team is committed to continuous improvement. Our production floor practices quality at the source, measuring quality every step of the process. The reduction of waste exposed through lean ultimately drives down costs and expedites manufacturing time, providing you with the most cost competitive component, increasing speed to market. Our team members are champions of continuous improvement. With a Quick and Easy Kaizen program, any team member can identify and implement an opportunity for improvement, increasing efficiency. As a result of lean management and Operational Excellence, AccuRounds is a highly flexible organization able to respond rapidly to changing customer needs. 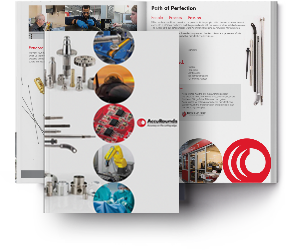 AccuRounds is dedicated to consistently satisfying the requirements of our customers. We will continuously improve our lean management system with an intense focus on internal processes, supplier relationships and customer service, while committing to eliminate all non-value added activity.